"Bigger and better than ever before!" The Phantom Of The Opera RETURNS to the Cadillac Palace Theatre on Thursday 15th December 2016. The intoxicating dark musical will be coming to the stage to give fans a performance like they have never seen before! The Andrew Lloyd Webber classic is a thrilling story of the beautiful soprano singer, Christine Daaé, who to the disfigured and behind the curtain musical genius, becomes his one and only obsession for life. Catch the dramatic and powerful show LIVE on Broadway this Winter! 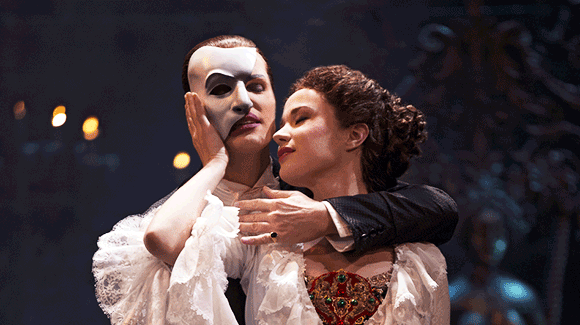 The songs featured in the wonderful yet haunting, Phantom Of The Opera are some of the most well known musical anthems in history and are often performed by talented vocalists all over the world. “Music of the Night,” “All I Ask Of You,” and "Masquerade" are just some of the beloved ones and will be performed in this stunning debut.